Adding a little spice to your life doesn't necessarily require an unlimited lingerie budget or the strength to swing from the chandelier. A diet that's low in fat and high in vitamin C helps keep you feeling your best, so add a scant peck of pickled pepperoncini to your culinary creations and get your party started. Pepperoncini are fat free and low in calories. They provide some solid nutrition, as long as you keep an eye on the sodium content of the pickled kind. There are two basic types of pepperoncini, Italian and Greek, according to the pepper experts at PepperScale. Both types are generally 2 to 3 inches long, though Greek pepperoncini are shorter and sweeter than the Italian version. When judging which pepper is the hottest, culinary experts use the Scoville heat unit, or SHU. Pepperoncini measure about 100 to 500 on the SHU scale, making them 5 to 80 times milder than a jalapeño. In addition to their sweet tanginess and crunchy texture, one pepperoncini offers about 83 percent of your recommended dietary allowance, or RDA, of vitamin C. It also supplies 11 percent of your RDA of vitamin A, only 15 calories and 0.1 gram of fat. Pepperoncini are often confused with banana peppers, which are similar but not exactly the same. Banana peppers have a far more tapered tip, and they're the only "hot" peppers that can be measured at zero on the SHU scale, meaning they're not at all spicy. Read more: Is Too Much Capsaicin Bad For You? Fresh pepperoncini can be difficult to find, but if you do manage to spot some in your produce section, look for those that are firm, with a crisp texture and no soft spots, recommends Kristen Mccaffrey at Slender Kitchen. The color should be bright green. Fresh pepperoncini can be used in all of the same ways that any other peppers can. Wash your peppers thoroughly, and remove both ends, the seeds and the membrane. Slice them into salads, soups or stews. Pickled pepperoncini are a great complement to both hot and cold sandwiches. When stuffed with fillings made of mushrooms, such as porcini, peppers make a simple, light and luscious lunch or dinner. Read more: Which Hot Peppers Speed Up Your Metabolism Best? Control the sodium level in your pickled pepperoncini by pickling them yourself. Wash your peppers, and cut a small slit in one side to allow the marinade to soak them both inside and out. Place the peppers in a jar with some bay leaves, a few garlic cloves and a sprinkle of peppercorns. Fill the jar with a boiling mixture of water, vinegar and salt. Put the lid on, and when the jar is cool enough to handle, put it in the refrigerator for three days. 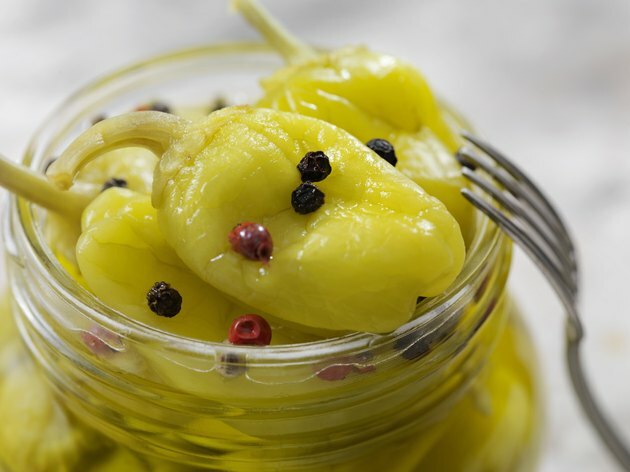 According to Registered Dietitian Erin Brunek writing for The Healthy Apron, commercially jarred pepperoncini can have as much as 600 milligrams of sodium per serving, so pickling them yourself means you can keep that number very low. While pepperoncini are not terribly spicy, they can irritate very young or tender mouths. One trick for easing their heat is to serve them with something creamy, such as mayonnaise, ranch dip or sour cream.